When I was around 20 years-old someone showed me Kurt Gödel's "proof of the existence of God" (a simplified version of course), and explained that Gödel, who I'd never heard of, was regarded as one of the most brilliant men of the century. I couldn't believe it! I looked over the proof, thought it was one of the most ridiculous academic pieces I'd ever seen, refutable by any intelligent 8th grader, and promptly filed the name "Gödel" away in my mind as a silly individual to be ignored. During those same years I was, on my own, playing around with ideas about self-reference in language, and what I later found to be known of as "recursion." Intuitively, I felt these were crucial concepts for comprehending the way the brain worked -- but ironically it also implied that we COULDN'T understand how the brain worked, because that would require the brain to analyze itself, and the point was, that I didn't think such a recursive process was possible -- a device cannot fully explore its own processes. My ideas were purely intuitive though, and I couldn't find a way to verbalize or refine them. So they just sort of hovered there loosely in the back of my mind. Some years passed and, in general, I deliberately ignored Gödel whenever his name arose, but at some point was reading a popular math volume by someone I respected, and it included a chapter on Gödel and this thing I'd not heard of called "the incompleteness theorem." Reluctantly, I read what this author I regarded highly, had to say about Gödel's work. And, I was blown away! Kurt Gödel was saying, and indeed being hailed for rigorously proving, what I could only barely sense, but never put into empirical words, that certain knowledge could never be proven using human logic, that any system of thought can only be fully known by another system outside or beyond that system. It was a tour de force. I suddenly wanted to read much more about Gödel, the man I'd earlier discarded to the intellectual junkbin. Gödel's life was of course fascinating, and he did have many somewhat 'crazy' thoughts (and I STILL regard his God proof as one of them! **), but simultaneously he generated some of the most profound ideas ever derived by human brains, changing the face of philosophy and mathematics forever, as few have done. There are so many good reads on Gödel and his work out there these days that I won't even favor any by singling them out; you can find plenty on him just by googling. And we've already had fine movies about John Nash, Alan Turing, and Ramanujan. Perhaps a film version of Gödel is not far off. "Gödel's theorem shows conclusively that in pure mathematics reductionism does not work. To decide whether a mathematical statement is true, it is not sufficient to reduce the statement to marks on paper and to study the behavior of the marks. Except in trivial cases, you can decide the truth of a statement only by studying its meaning and its context in the larger world of mathematical ideas. "Science in its everyday practice is much closer to art than to philosophy. When I look at Gödel's proof of his undecidability theorem, I do not see a philosophical argument. The proof is a soaring piece of architecture, as unique and as lovely as Chartres Cathedral… The proof is a great work of art. It is a construction, not a reduction. It destroyed Hilbert's dream of reducing all mathematics to a few equations, and replaced it with a greater dream of mathematics as an endlessly growing realm of ideas. Gödel proved that in mathematics the whole is always greater than the sum of the parts. Every formalization of mathematics raises questions that reach beyond the limits of the formalization into unexplored territory." Even though this isn't a math book I planned on reviewing it here, but that effort turned into 4 - 5+ pages of pedantry, there is soooo much to discuss or pass along from Sean's writing. There were also too many bits I wanted to quote... and, too many bits I'd want to take issue with... and too many bits to point out for contemplation... So I'll scrap most of that and opt instead for a few broad brushstrokes -- having looked at a number of the reviews of this book, I'm in good company, as I've not seen any that adequately cover its wide-ranging contents. First, this is (to me) a fun read (the most fun read of all Dr. Carroll's books), and given the time of year, could even be called a "beach read" for science geeks at least. I'd almost recommend reading the very last short chapter of the book, "Existential Therapy," first. Even though it makes for a nice ending, it also gives a feel for how Sean's life journey to his current views transpired, and that may be helpful from the start. I like the joy one senses in Dr. Carroll's attempt (even mission) to communicate science (and specifically his "poetic naturalism" viewpoint), to the masses. He writes out of conviction and purpose to spread his own gospel as it were (though he'd probably object to that phrasing). It's always great to see people who don't merely go through the motions of writing or education, but seem truly invested in it. Sean covers most all the major disputes between scientists and non-scientists (including creationists, intelligent-design folks, religionists, supernaturalists, solipsists, etc.) here -- which makes this a nice one-source reference for a lot of time-worn debates, as well as many of the arguments within the science community itself. Perhaps the single most stringent idea running throughout the book is that you cannot defy the known laws of physics; any belief, theory, conception-of-reality one holds must be compatible with what we know of the particles, fields, forces that make up the universe. And this is where he'll catch a lot of flak for disputing the possibility of any future knowledge upsetting the apple-cart of our current-day understanding of those laws of physics. Who can see 5000 years ahead, even 1000? The picture of forces, particles, fields, just a century or two ago was vastly different than it is today. He continues his long-held contention that a single mathematical formula accounts for how our everyday lives in the Universe proceed. And pushes his oft-spoken (but I think minority) support for the many-worlds/Everettian view of quantum mechanics. Carroll admits repeatedly that science is filled with uncertainty, doubt, the possibility of new evolving information, and that all those in the past who have declared some area of knowledge to be absolute or complete, have been shown to be laughably wrong. He admits that we cannot be "100% metaphysically" certain of anything, and that nothing is ever "proven" in science, but then seems to dismiss that as of no consequence, and annoyingly accepts physics laws as true based on the scant few decades of localized evidence collected. In short, it's annoying how easily Sean sweeps aside any possibility of enormous paradigm shifts (for lack of a better term) of our present state of knowledge. Critics will accuse Sean of "scientism" (a term I'm not terribly fond of) and worshiping a perceived, but illusory, rigor that physics bestows via "the Core Theory." Yet in mathematics, a billion true examples of something DOES NOT by itself prove that something is true (i.e., the Riemann Hypothesis); but in physics far, far fewer than a billion examples are enough to convince physicists of universal, unerring truth and precision. Induction may be necessary in the world (and physics), but it is not truly sufficient. Carroll has been dismissive of Karl Popper in the past, but I was still surprised that Sir Karl doesn't even warrant a mention in the book. Similarly, no Carl Hempel, Doug Hofstadter, or Noam Chomsky and on the physics side, no mention of David Bohm, Lee Smolin, David Deutsch, or Freeman Dyson; one could probably easily cite two dozen more names oddly missing from these pages. But then, only a few of the thinkers that Sean does bring up get more than a few passing sentences of space; just a somewhat odd assortment. I don't even know how Sean knew when this book was done (other than the publisher setting a deadline), since the material could have easily gone on for another couple 100 pages. Some of the weakest parts are in the last few chapters, where Sean dabbles in free will, causation, ethics, qualia, and other bits of philosophy (I would almost say 'semantic quicksand'), though I did somewhat enjoy his "10 Considerations" as substitutes for "10 Commandments" toward the end. Some of the philosophy discussion felt like token acknowledgment of philosophy's pertinence, while at other times Carroll's interest in philosophy seemed more genuine. 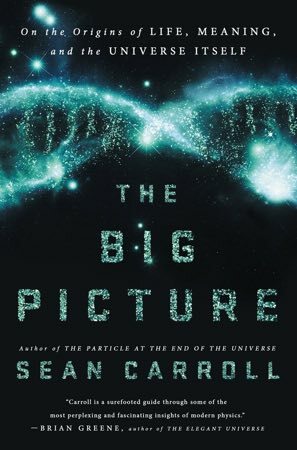 But per usual, Sean is at his best when explaining physics and his perception of how the world (Universe) works; though if you've read his earlier books, you may not find much new material from him here on that. Anyway, there's an awful lot to chew on in these pages, and I can't imagine any science-minded person won't enjoy reading it, whether you agree or disagree with Dr. Carroll's conclusions. This is a FUN-damental science joy ride, and a review can't do justice to the synthesis Dr. Carroll has attempted with it. The good parts are VERY good, and the weaker parts are still interesting, but just feel sketchy, with counter-arguments not always getting their due. Still, it is a sincere attempt by an infectiously-curious scientist to objectively grapple with the "big picture" of human existence and offer food-for-thought in very readable text. Depending on your own background, different parts of the volume will appeal to you most. It's a fabulous book for starting discussions... just not necessarily a great one for ending them. "The Big Picture" won't re-appear on my end-of-year Top 10 list here, because it isn't a math book, but it ought appear on any other end-of-year 'Top Nonfiction' list I can imagine. James Propp doesn't post as much as a lot of other math bloggers... but when he does (once-per-month) it's always a delight! ...But then, if you read Jim you already know that; if you don't, check out his MathEnchantments blog as soon as you can. Jim is a professor at the University of Massachusetts/Lowell, having been previously associated with Harvard, MIT, and U. of Wisconsin/Madison, among others. 1) Tell us whatever you'd like about your path to becoming a mathematician, including when did you know you wanted to pursue mathematics professionally? I've been quasi-obsessed with math since an early age. During elementary school recess, I was the kid in center field trying (unsuccessfully) to compute twenty-six cubed in my head (because that's the number of three-letter initials a person could have). I developed strong interests in music and theatre, and toyed with the idea of pursuing musical theatre professionally, but in the end I returned to my "first love" and I've never regretted it. I've wanted to run a Martin Gardner-esque column for decades, but research and teaching and family life kept me busy, and I kept putting it off. But it was family life that eventually led me to the name of the blog. Reading to my kids and making up stories for them made me realize the ways in which the world of math --- a world that at first exists just on the page but then becomes immersive when you figure out how to jump into the page --- has become, for me, a replacement for the magic that I hankered after in my own childhood. Once I became aware of this link, the blog named itself. And luckily no one else was using that name! 3) You only blog once per month but it is always a fairly substantive, thoughtful, longish post (and quite unpredictable as far as topic)... How do you decide what you will post on each month, and how far ahead do you work on posts? Sometimes I write pieces to help jump-start other, more formal writing projects. And sometimes I opportunistically exploit tie-ins with current events (my last essay, on Fermat, was catalyzed by Andrew Wiles winning the Abel Prize, and my next essay, on Ramanujan, will hopefully ride the coat-tails of the movie about Ramanujan now showing in theatres). But mostly I just follow my enthusiasms, which shift unpredictably. I'm hoping to get six months ahead in my writing, but for now at least I pretty much work month-to-month. I have a large file of ideas, and one of the things I do when I write a piece is I scan through my ideas file to see if any of those ideas tie in nicely with the piece I'm working on. Finding these connections is one of the pleasures of the work. It's also one of the reasons why my essays tend to be on the long side. 4) You recently considered starting a podcast... can you say anything about how that's going in these early stages? Right now I'm considering recording some of my Mathematical Enchantments essays in audio format, for the sake of the vision-impaired and people who like me spend a lot of time driving. I'm not sure that qualifies as a podcast. In any case, I don't plan to do it unless more people say they'd actually like to listen to me reading my essays aloud. I'm a big fan of podcasts and I'd love to get involved with one, but I don't think I'd want to do it on my own; the podcasts that I love the most (like RadioLab and Invisibilia) feature multiple voices and multiple points of view. Also, most of the ideas in my ideas file have a visual component --- I haven't got a supply of story ideas suited to oral presentation. Maybe in a few years I'll start to think more seriously about podcasting. In the meantime, I'm planning to make some short videos about chip-firing, discrete probability, and generalized radix-systems, since the link between those topics is a really pretty story that hardly anyone knows. It ties in nicely with the "exploding dots" pedagogy that James Tanton has developed (partly inspired by a talk I gave over a decade ago, which in turn was based on Arthur Engel's "probabilistic abacus"); the World Math Project has adopted exploding dots for its inaugural year, so there should be some Jim Propp videos on chip-firing etc. when the World Math Project debuts in October 2017, if not sooner. You'll have a chance to not just hear me but see me talking about mathematical ideas that excite me. 5) Any plans in your future to write a popular math volume, based on your blog (or other material)? My blog posts double as drafts of chapters of books I hope to write someday. I'm too undisciplined (and busy) to write books one at a time the way most authors do, but I think once I've got ten years of essays written, I'll start tying them into thematically coherent bundles and writing some new material to bring specific themes to the fore. 6) What are some of your own favorite popular math reads, and/or books you'd recommend to others wishing to be 'enchanted' by math? As a kid I enjoyed "One, Two, Three, Infinity" by George Gamow and several books by Isaac Asimov; as a teenager I enjoyed Martin Gardner and Carl Sagan; and in my twenties I enjoyed Douglas Hofstadter and Raymond Smullyan and Rudy Rucker. But that's all old stuff. I wish I'd kept up with the last thirty years of popular writing in mathematics, so that I could give a more up-to-date answer! 7) Professionally, what math problems/areas are you currently most interested in, or working on? I spread myself pretty thin (more than I think is wise, professionally), and am usually thinking about a dozen or more problems in rotation. Right now many of these problems are about iterative processes of a combinatorial nature. One example concerns something called Bulgarian Solitaire that I learned about from a Martin Gardner column. Arrange n objects into piles, and create a new pile by taking one object from each old pile. Do this again. And again. Here's the new bit: Each time you do it, write down the number of piles. As time goes to infinity, the average of the numbers you've written down converges to a particular number that (unsurprisingly) depends on n but (surprisingly) does not depend on the original way in which you arranged the objects into piles. (Compare what you get starting from 6+2 with what you get starting from 5+3, for instance; in both cases the average number of piles converges to 3.5 over time.) There are lots of phenomena like this all over combinatorics. Wow! sounds like we have a lot to look forward to coming from you Jim. Thanks for taking time to tell us a little about yourself and what may be coming down the pike. You walk into a room that has two enormous bins in it. An evil genie is in charge of one bin which contains an infinite supply of ping pong balls, each of which bears a positive integer label on it, which is its 'rank' (from "1" up to any imaginable number, short of infinity). And, moreover, for EVERY integer there are an INFINITE number of such balls available; i.e. an infinite no. of "#1" balls, an infinite no. of "#726" balls, an infinite no. of "#3,376,422" balls, etc. etc. etc. Now, YOU are in charge of a second bin that contains some FINITE number of these very same-type balls. When you walk into the room it has some set number and variety of balls in it; could be 3 balls total or 500 trillion -- believe it or not, it makes NO difference for the final solution of this puzzle. The game proceeds in rounds, in which, first you and then the evil genie, take turns. First, you get to remove ONE ball from the finite box and discard it... BUT once you remove a ball, it is the evil genie's turn, and he gets to replace the ball you discarded with ANY number of balls he wishes OF A LESSER RANK from his infinite bin... i.e., you might discard a "#7" ball, and he could put back in to your bin 37 trillion "#4" balls (or he could put in three "#5" balls if he so chose; he just can't put in anything #7 or above). The sole exception is when you remove a #1 ball, because there are no 'ranks' below one, so there are NO replacements for a #1 ball, and in essence, the genie loses a turn. But in all other instances he can place as many balls as he wishes back into your bin. Now the question: Is there any strategy you can use to insure you will eventually be able to empty out your box?... or is it rather the case, that the evil genie can, if he so wishes, PREVENT you from EVER emptying out your bin? ...It seems obvious that the latter is the case, as, over time, he replaces almost all of your discarded balls with mind-numbing quantities of fresh balls. Now that would make for a boring puzzle, wouldn't it... So of course, the answer is, contrarily, as Martin Gardner writes, "Incredible as it seems at first, there is NO WAY to avoid completing the task." [bold added] i.e., mathematically-speaking, over enough time, you will ALWAYS empty out your bin! Completion of the task is "unbounded" (there is no way to predict the number of steps needed to complete it, and indeed it could be a VERRRRY large number), but the box MUST empty out within a finite number of steps! Realize that once there are ONLY "#1" balls left in the box you simply discard them one by one (no replacement allowed) until the box is empty -- that's a given, and then the game is over, no matter how long it takes. In the simplest scenario we could start with only "#2" and "#1" balls in the box. Every time you remove a "#2" ball, the genie can ONLY replace it with "#1" balls, thus at some point (it could take a long time, but it must come) ONLY #1 balls will remain, and then essentially the task is over. S'pose we start with just #1, #2, and #3 balls in the box... Every time a #3 ball is tossed, it can only be replaced with #1 or #2 balls. Eventually, inevitably, we will be back to the #1 and #2 only scenario (all #3 balls having been removed), and we already know that situation must then terminate. The result is both simple and amazing, and reminiscent of some of Cantor's mind-wrenching deductions.